The endoplasmic reticulum (ER) is an important organelle in eukaryotic cells. It plays a major role in the production, processing, and transport of proteins and lipids. The ER produces transmembrane proteins and lipids for its membrane and for many other cell components including lysosomes, secretory vesicles, the Golgi appatatus, the cell membrane, and plant cell vacuoles. The endoplasmic reticulum membrane system can be morphologically divided into two structures–cisternae and sheets. Cisternae are tubular in structure, and form a three-dimensional polygonal network. They are about 50 nm in diameter in mammals and 30 nm in diameter in yeast. ER sheets, on the other hand, are membrane-enclosed, two-dimensional flattened sacs that extend across the cytoplasm. They are frequently associated with ribosomes and special proteins called translocons that are necessary for protein translation within the RER. Endoplasmic reticulum is an extensive membrane network of cisternae (sac-like structures), which are held together by the cytoskeleton. The phospholipid membrane encloses a space, the lumen from the cytosol, which is continuous with the perinuclear space. The surface of the rough endoplasmic reticulum is studded with the protein manufacturing ribosome, which gives it a rough appearance. Hence it is referred as a rough endoplasmic reticulum. The smooth endoplasmic reticulum consists of tubules, which are located near the cell periphery. This network increases the surface area for the storage of key enzymes and the products of these enzymes. Rough endoplasmic reticulum synthesizes proteins, while smooth endoplasmic reticulum synthesizes lipids and steroids. It also metabolizes carbohydrates and regulates calcium concentration, drug detoxification, and attachment of receptors on cell membrane proteins. 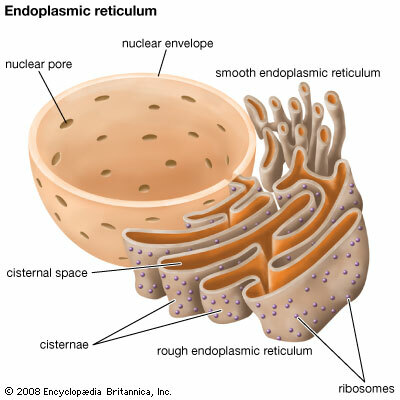 Endoplasmic reticulum varies extensive extending from the cell membrane through the cytoplasm and forming a continuous connection with the nuclear envelope. It is mainly responsible for the transportation of proteins and other carbohydrates to another organelle, which includes lysosomes, Golgi apparatus, plasma membrane, etc. They provide the increased surface area for cellular reactions. They help in the formation of nuclear membrane during cell division. They play a vital role in the formation of the skeletal framework. They play a vital role in the synthesis of proteins, lipids, glycogen and other steroids like cholesterol, progesterone, testosterone, etc.